It’s an unforgettable experience, whatever you’re watching. An ideal match for the largest and most lavishly equipped home cinema rooms, the VPL-VW5000ES brings movies to life with extraordinary cinematic detail, colour and contrast. 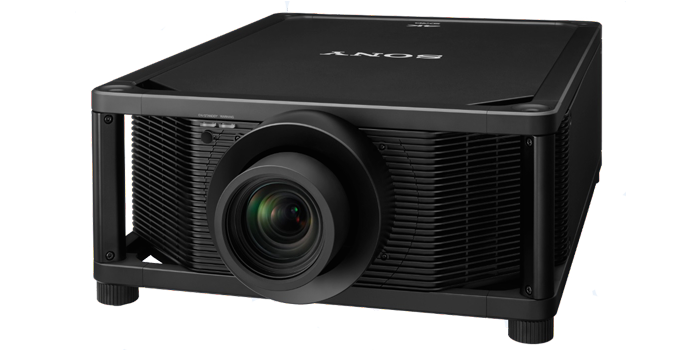 The world’s most advanced home cinema projector combines an advanced laser light source with the same Sony 4K SXRD panel technology that’s found in our professional cinema projectors. Crisply detailed native 4K images (4096 x 2160) offer four times the resolution of Full HD, pulling you right into the heart of the action with unprecedented clarity. You’ll experience fabulously rich cinematic colours, smooth motion and spectacular contrast. Extremely powerful 5000 lumen brightness ensures wonderfully clear and sharp big-screen pictures, even in well-lit rooms. The ultra-pure, highly efficient laser light source provides virtually maintenance free operation with no lamp swaps. As well as spectacular picture quality and reliability, you’ll enjoy reduced operating costs compared with conventional projection systems, plus less worry of lamp failure half way through the show. You’re future-proofed with compatibility for the latest 4K standards, including High Frame Rates and HDR (High Dynamic Range) – so you’ll get the very best out of today’s content, and tomorrow’s. With flexible installation, simple setup, fuss-free auto calibration and low-noise operation, the VPL-VW5000ES 4K Home Cinema Projector puts you in control of the ultimate entertainment experience. SXRD panel technology featured in our professional cinema projectors delivers native 4K (4096 x 2160) resolution images, with no artificial pixel enhancement. Every detail is wonderfully clear and natural, without jagged edges or visible pixels. Inside the VPL-VW5000ES is an ultra-pure, reliable laser light source with Z-Phosphor technology. Coupled with the panel’s super-fast response rate, Motionflow technology means you’ll see every detail with minimal blur – no matter how fast the action. The VPL-VW5000ES can project Ultra HD content at up to 60 frames per second (4K 60p YCbCr 4:4:4 8 bit/ YCbCr 4:2:2 12 bit) for even smoother images with superior colour and realism. Support for HDCP 2.2 lets you enjoy the latest 4K content services. Enjoy a near-native 4K experience with discs ‘Mastered in 4K’. It’s as close as you can get to the 4K-pixel resolution and expanded colour range of the original. ±30° tilt capability allows flexible installation in a wide range of home cinema environments such as rear projection. The projector’s built-in RF transmitter synchronises with any RF 3D glasses for wider coverage and greater stability, so there’s no need for an external transmitter. With an impressive 5,000 lumen brightness and a spectacularly high contrast range, 4K images are clear and bright with sparkling highlights and rich, deep blacks – even in well-lit rooms. You will enjoy an extended range of spectacular colours, far wider than a standard projection system. The VPL-VW5000ES supports the same DCI-P3 colour space as professional cinema projectors, as well as the new BT.2020 colour space (emulated) that accurately captures an even wider range of true-to-life tones. Take full advantage of High Dynamic Range (HDR) for stunning contrast and an impressive range of brightness levels, from searing highlights to richly detailed dark scenes. As well as projecting native 4K content, the VPL-VW5000ES upscales your Full HD Blu-ray™ or DVD movie collection to 4K with Reality Creation – Sony’s Super Resolution processing technology that enhances lower-resolution content, and even upscales 3D movies to 4K resolution. Memorises up to five zoom lens positions for future viewing. Stored settings can be matched to a movie’s aspect ratio, including 16:9 and Cinemascope. Don’t keep your audience waiting for the show to begin. With quick start, thanks to laser light source technology, you’re all ready to start projection right after initial power-on.